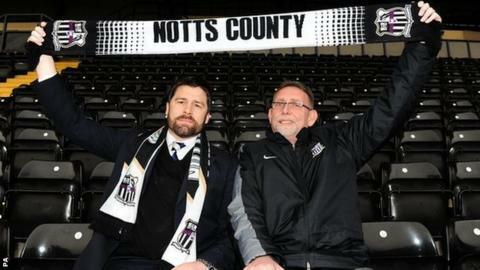 The powers that be at Notts County could surely be forgiven for playing down hopes of a promotion challenge. Five games into the new League One season, the Magpies are top of the table and earning widespread praise for the brand of football they are playing under Keith Curle. But Curle is the 12th permanent manager in 10 years at Meadow Lane and supporters are used to false dawns. Chief executive Jim Rodwell has certainly learned to take a measured view from his time in the beautiful game. "The moment you think you've cracked football is the moment it comes back and kicks you in the proverbials," said Rodwell, who played most of his career in non-league football before moving into the money side during an enormously difficult spell at Boston United. "I tend not to take a lot of notice of it - even when things are going well, we are top of the league and everyone thinks it's fantastic. "You have to just keep doing what you think is the right thing to do and have the courage of your convictions. "If you are doing well or not doing so well, then you have to have a plan and stick to it." The plan has altered too many times to mention in the past 25 or so years. County fans have witnessed some incredible highs, including various promotions, Wembley visits, top-flight football, some wonderful cup runs and a brief spell where it seemed like they were one of the richest clubs in the world. But the lows have lingered around the memory banks just as much. They have been threatened with administration, bankruptcy and seen their team freefall all the way down the leagues to the point of nearly losing their Football League status. And they have suffered the ignominy of having to return from cash-laden superpower to lower-league normality following the Munto Finance fiasco. Rodwell, who took over in his current role when Ray Trew brought the club in February 2010, is still enjoying their lofty position, but he knows there is plenty of hard work to be done. "It's where you all want to be but it's very early days in the season and we don't want to put any pressure on anybody," he said. "We're delighted. It's a much nicer place to go to work on a Monday when you've won, let alone are top of the league, but there are no prizes handed out in September." Sacking managers and a sizeable backroom staff at a regular interval is not cheap. Notts should know. No manager has lasted more than two years since Sam Allardyce at the end of the last century. And although the Magpies have a reputation for parting company with managers at the drop of the hat, Rodwell insists it is very much a last resort. "The reality is that it's an expensive business. We have been chastised - and rightly so in some quarters - for having too high a turnover of managers," Rodwell said. "But nobody wants to sack a manager. Sacking managers is an expensive hobby. But it's not just the manager, there are all the coaching staff. There are contracts to honour and you have to replace these people. "But you have to be convinced you have the right people making big decisions at your football club. "Every time you invest in a manager it's a long-term thing. "You want it to work, you give them all the resources you can. Sometimes it works and sometimes it doesn't. At the moment everything is going swimmingly and the results are coming." Curle has been quick to pay credit to the part played by his backroom staff of first-team coaches Colin Lee and Colin West, development squad manager Chris Kiwomya and goalkeeping coach Kevin Pilkington. And way from the first team, things also appear to be on the up. Notts are now training at the FA's new national football centre at Burton and Rodwell says the club's Centre of Excellence and youth programme will be central to their plans. It was closed as part of a cost-cutting exercise in May 2006 - a decision described by Rodwell as "astonishing", before being relaunched in 2008. "It's got to be the lifeblood of a club like Notts County," Rodwell explained. "I don't think we will ever be in a position where we are spending tens of millions on footballers. We are lucky in Nottingham that it's a hotbed for football and has always produced footballers. "We have to make sure they start off by wearing black and white rather than red." Notts County had seven different permanent managers in two and a half years, from Ian McParland in Oct 2009 to Keith Curle in Feb 2012. Back to the first team and Curle is thriving on the fact his side are top of the pile: "It will be a learning curve. "Now we are top of the league the players will come under scrutiny and there will be a different type of pressure and atmosphere because everyone wants to beat the team that are top. "We are not scared at being top of the league and we want to enjoy it. Why? Because if you are a professional, you want to be at the top of your tree." BBC Sport will be taking a closer look at stories from outside the Premier League before every weekend league programme in our Football League Friday features.